The festival of colours, Holi which sees everyone drenching in water and colours is finally here and you can see the excitement among those celebrating. Where Holika Dahan was marked on March 20, people today in India will be celebrated the rangwali Holi; March 21. The rangwali Holi sees an outburst of colours and over the years we see elaborate celebrations in the form of events. Holi parties and Holi events are organised in different parts of the city which see enthusiastic participation of everyone. These are special Holi events which have music concerts, dance, pool parties or even camping. Even in Mumbai, there are several events which will mark the celebrations of the festival of colours in much exuberance. 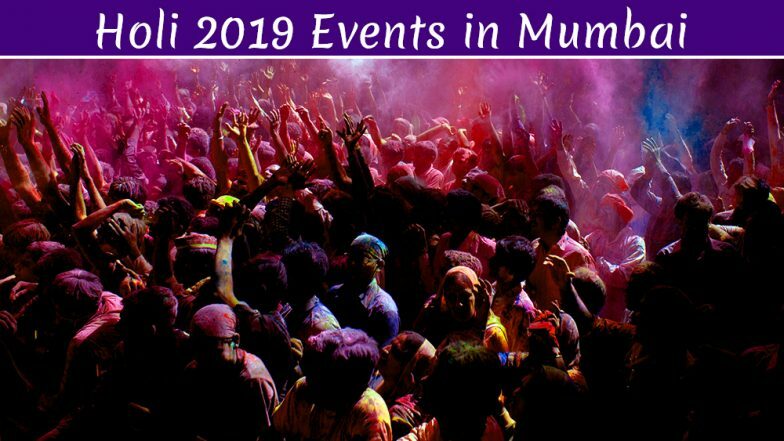 If you are still clueless and have no plans of celebrating Holi yet, let us help you with some Holi 2019 events that are taking place in and around Mumbai. Holi Dressing Tips: Different Ways to Wear White Inspired by Bollywood Celebrities at Holi Party. Playing Holi is an awaited time for not just the children but also the elderly. It is all about smearing everyone with colours and just enjoying themselves. Be it a waterless Holi or getting fully drenched, the excitement about it remains. With more and more people eager to participate and celebrate together, different events and parties are held around the city. From pool parties and music concerts to Holi camping, there are different events which can suit your interests. Holi 2019: How to Throw a Perfect Holi Party; 7 Tips to Keep in Mind. Enjoy the feeling of a sunburn event with the Holi special happening at MMRDA grounds in BKC, Mumbai. DJ Snake will be present here so you can groove to his hit songs and enjoy yourself along with colours. The tickets start at Rs 1000. Adlabs Imagica, the amusement theme park will be hosting a Holi party from March 21- March 24. You can book an entire package for Rs 1099 onwards which includes your breakfast, Holi special buffet, snacks and a glass of Thandai. You can have double the fun by playing with colours along with taking the rides here. If you haven't been to Imagica yet, you could head there for Holi. The best thing to beat the heat this summer is to hit the pool. And what better way to celebrate Holi than being by the pool? Khayra Events is hosting a pool party at Gorai on March 21. It is priced at Rs 2500 for a couple and Rs 1500 for singles. They will be using dry colours and Neon colours here. You will have to buy tickets in advance as they do not have on the spot bookings. If Adlabs Imagica is too far for you, then you can also enjoy the Holi festival in Mumbai's theme park, Essel World. The pass costs Rs 1270 for adults and Rs 900 for children. So you can go together as a family and have a day-long celebration. If you want to be away from the city and love camping then there are several camping events on Holi, March 21. The Yamunavan Camps in Dahanu is organising a camping event. You can enjoy the bonfire as Holika Dahan and spend your night in the tents. There is another event happening at Bhandardara, a beautiful tourist spot a little off Mumbai. So if you love camping then you should start looking for these special Holi camping events and make your bookings. You can enjoy playing by the beachside at the Sun Beach Resort in Gorai, Mumbai. And if EDM and Trance is your jam, then you will definitely have a blast here because that's how the music is going to be. But don't worry, there is also another lineup of remarkable artists. You can enjoy getting tipsy to the beats and have an eventful Holi. The price starts at Rs 600. This year you can take your Holi playing experience in the wilderness with this event organised at Forest Hills in Tala. Called the Colors of Forest, it has a lineup of DJs who will be performing live while you dance and enjoy. It is a bit on the expensive side at Rs 3500 considering the above events. The package will also give you a 20% discount on their spa services. We hope the above list gives you a choice to decide where you should be heading to play Holi 2019. If you love dance and music, then you can head to the events in the city. Or if you are someone who prefers quiet and calms away from the city, you could go camping. You might want to start booking right away because chances are the tickets may be sold out.